We arrived in Baeza last night and immediately hit the square to find a little tapas to finish the evening off right. We visited Los Archos where every drink we ordered came with a free tapa, typical of tapas bars in southern Spain. “Una mas, por favor” resulted in another beer with another different tapa slide down beside it. When the Lomo arrived, we were floored – so simple and yet so amazing. 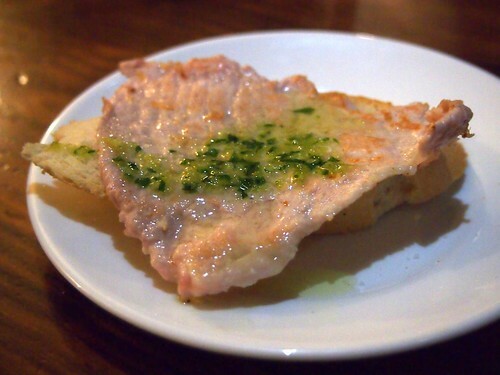 A slice of pork loin sauteed in olive oil with garlic, parsley and salt. This was so good a second order was put in immediately. Mercy. I’m printing this homage to pork and hanging it on my wall of salivation. Thanks for the good bite!